Do you agree with the concept of 3 different Military Paths, each with its own rank? Don't have a rank for people with 1 point. That will make people want to get it. firth4eva wrote: Don't have a rank for people with 1 point. That will make people want to get it. That should be at 400, maybe 500. Why? What possible reason can you fathom to do it? Rank 600 cook vs rank 400 cook, I sincerely doubt one is ANY better than the other. Tons of people lose on purpose and try and get as low as they can. Then when they beat people they get 100 from everyone. 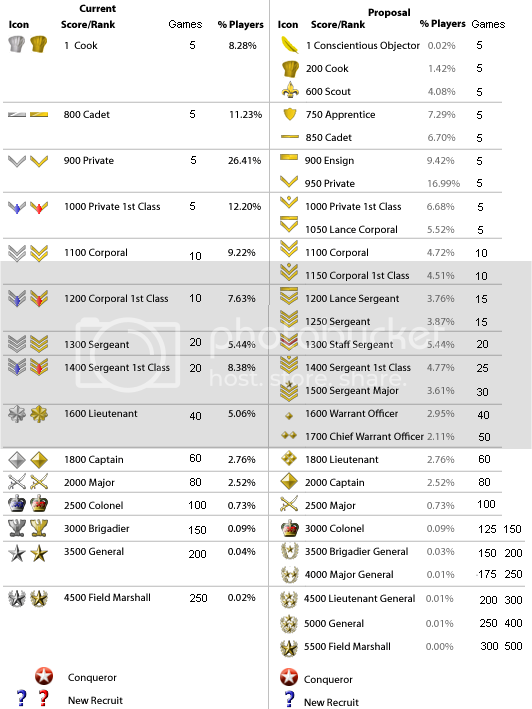 Night Strike wrote: I like all these new ranks, except for the really low ones. Having really low ranks could encourage intentional deadbeating and throwing of games to achieve the distinction as being the "Only Conscientious Objector". Maybe they have to have completed X amount of games or won X amount of games? or been on the site X amount of time? The original list had more ranks at the higher end of the scale, but has evolved as a result of 'player-volume-per-score' to instead increase the number of ranks at the 'low' end of the scale, as well as adding a couple of higher ranks. There may not be a lot of difference between a Sgt and a Sgt 1st Class, but the different ranks give something for the average player to aspire to - try considering them as individual goals rather than absolute indicators of ability. There may not be any apparent difference between the ability of a 250pt cook and a 750 pt cook, but one has a score three times higher than the other. It is this disparity that the suggestion is trying to balance. Not gonna say a word about your perversions H2. Ohh btw- Qwert, if you're suggesting an overhaul why not get rid of the crown looking hat? Maybe have an actual Colonel insignia albeit you'd have to change the Brigadier one too. Last edited by Qwert on Fri Jan 21, 2011 5:41 am, edited 1 time in total. i do not like the idea, i honestly do not see the problem in having a lot of high ranks. The site is growing, therefore the amounts of people in ALL ranks is going to grow. As the saying goes "if it aint boke, dont fix it"
I've said it before, your rank is to the left of your name in the scoreboard. Directly to the right of your name is your score, all else can safely be ignored. lancehoch wrote: If the change is implemented, what are the completed game requirements for each rank? Like how now you need 100 games to be a colonel. Any comments? THE ARMY wrote: I don't like the idea of more ranks. It isn't very easy to get high ranks.See the reason you made this post was to make it more fun to reach the top of the scoreboard. My intention had nothing to do with getting to the top of the scoreboard... Just about helping give people individual targets to aspire to that may be more tangible... as well as helping to differentiate between the 80% of players who are ranked below Sgt. I'm still in support of introducing new ranks, although the idea lost momentum after the medals were introduced. Why not simply, instead of starting on 1000, start on 0. You lose and win points in the same way as before. However, ranks are determined by percentages. The bottom 10% are Cooks, the next 5% are Privates, or whatever. This would COMPLETELY ELIMINATE inflation, although it does mean you have to carry on winning games to stay at the top. If everyone started at zero, how would anyone gain points? My win percentage is fairly high, only because I play a lot of 2 or 3 player games. Players between 11% and 20% are coronel. And I think it is a very good suggestion! This could be combined with MrBenn ranks. Just instead of base them in score threshold, base them in % of the scoreboard. I didn't read it properly: but I'm so tired!! i think that need to change ranks,and mrbeen will be good. Far before when i start these topic,people say" its will be dificulty for people to cross 5000 point,no need for change" but now people cross these line,and now we have very large number of Fieldmarshals,Generals,Colonels,and every day these numbers become bigger. Right! It would not avoid score inflation, but would make ranks inmune to it. I think it also would have the benefit to encourage players with less than 1000 points to continue playing, as is the scoreboard position and not the score what determines their rank.